End of Line - Sage Automation Inc. 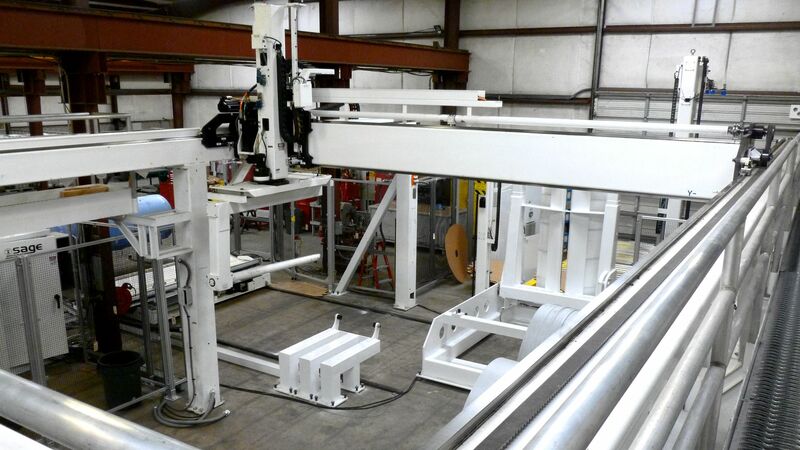 The pictured Sage Roll Handling system accepts 4,000 pound slit rolls from the end of a winder, transfers the rolls to a shaft extractor, pulls the shaft, further transfers the roll to the Sage Gantry robot where the roll is sorted by slit width. Finally packages are upended, labeled, wrapped, and conveyed out to the warehouse. Sage is an Automation Engineering Company that can help you achieve your goals of increased productivity while significantly reducing your labor costs by developing a custom automation system tailored to your business, whether its roll handling from end of line to warehouse or some robotic palletizers Sage can automate any of your material handling needs.